I have a SCIENCE QUESTION (dah duhduh DAAAH) about variegation. Isn't the point of a plant being green for good light wavelength absorbency? I mean, plants that are other colors besides green still absorb most of the spectrum because of different kinds of chlorophyll, etc. 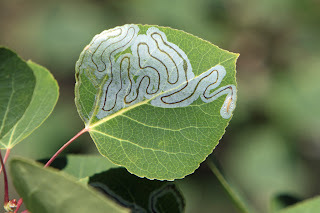 But what about the plants that are variegated to have mainly white leaves? What is up with that? Doesn't the color "white" mean that all the wavelengths are reflected back? So how would they photosynthesize properly if they couldn't trap light efficiently? With some of these plants, there is still some green or other color, but it doesn't seem like it would be enough to support such a big plant. You are absolutely right -- completely white sectors on leaves don't photosynthesize, and plants that produce whiter leaves are going to be inherently less vigorous than ones with green leaves. So why are they like that? Most variegated plants are essentially man-made -- they are unhealthy, mutant freaks that would die if we didn't like them and keep them alive in our gardens. Sort of like chihuahuas (except chihuahuas are disgusting and variegated plants are delightful.) 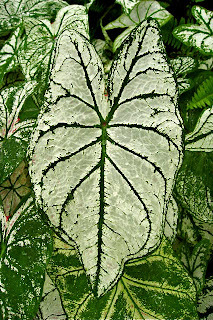 Surprisingly, however, some wild plants, like some caladium, begonia, and dieffenbachia naturally have white patches on their leaves. Breeding has increased the amount of white on the plants we grow, but still, the wild plant have distinct white patches on their leaves. Why? This leaf looks TERRIBLE! There must be a million leaf miners and caterpillars already there, munching away for this leaf to have so little green on it. So you fly on... fooled by a sneaky, variegated plant. 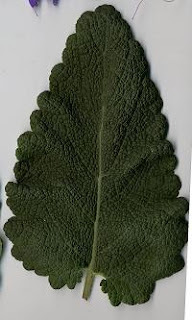 The plant has made a trade off: less efficient photosynthesis in exchange for not being eaten alive. In other words, natural leaf variegation is the plant equivalent of pretending you have whiplash in order to get insurance money. This is a fact that should make those of you who don't like variegated plants because they look unhealthy rethink your position. That is just what those plants WANT you to think! You are being fooled, just like the little leaf miners. Go buy some today just to show those plants you are smarter than them. Leaf variegation in Caladium steudnerifolium (Araceae): a case of mimicry? Wow! Never thought I'd learn this in a gardening blog. Great post, as usual. Loved this answer, Joseph! Love variegated plants too (but not Chihuahuas). Just proves to me, I am not to old to learn. wow! I had no idea ! Love your Sciency Answers posts. Always informative & entertaining. But what's with the chihuahua-hating. Did one bully you when you were a kid? The variegated plants pay a price, though- they almost never grow as vigorously as the all green versions. I've grown variegated and non-variegated plants side by side (same species) and usually the green ones are about 1/3 more vigorous. I'm wondering- I've always propagated variegated plants by asexual propagation, but does the genetic mutation that created them extend to the seed? Glad you guys enjoyed it! I had fun (and learned a lot) writing it. Jim, doesn't everyone hate chihuahua's? The ones I've met are yappy and ill-manned. With propagation from seed, sometimes yes, sometimes no. With the plants I'm talking about here, the naturally variegated ones, it does come true from seed. Many, perhaps most, of the cultivated variegated plants won't however. There is a LOT more I could say, and probably will as some point. I think Jim must have it right...you were bullied by a Chihuahua as a kid right? I mean how else could we explain a perfectly rational intelligent grown man picking on a little dog with tooth-pick legs? p.s.s. My dog has a Chihuahua grandparent. Does that make her just 25% disgusting? Perfectly rational? Who? What? Me? No, I don't think your dog is 25% disgusting. Unless, of course, it is 25% yappy, rude, hyper, and generally lacking in decorum. If so, I reserve the right to dislike it. But I'm sure your dog isn't. Hrm, I never even thought of that. All my years in hort school and that was never mentioned. I suppose it would have helped if one of us asked the professor! Fascinating! Thanks for the explanation. Now I know why I love variegated plants so much. They're smart! How cool! Always wondered about that. A dog is rude? It has no manners? It's a dog. What's your excuse for being rude, pretentious, and judgmental? You're a douchebag. I reserve the right to dislike you. That is all.